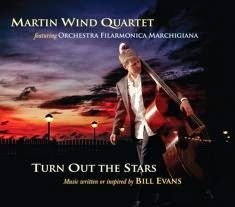 Turn Out the Stars is a collection of songs inspired or written by the great pianist Bill Evans. 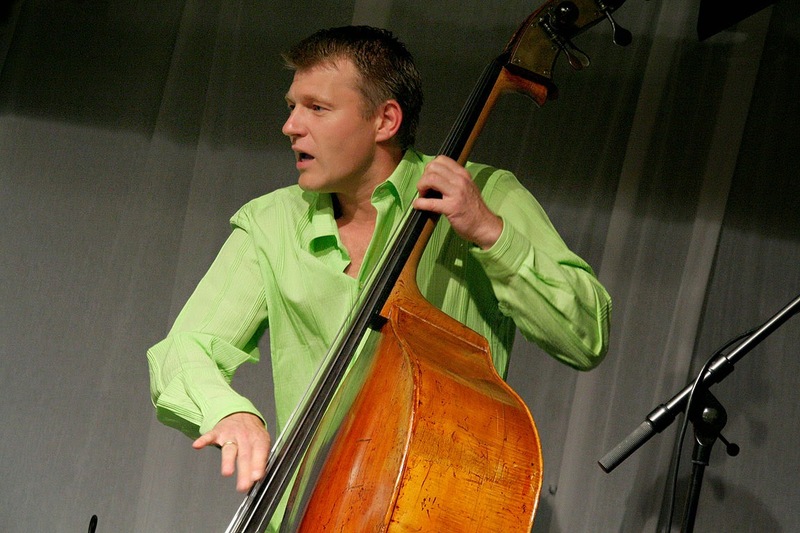 The music is written and arranged for orchestra by the German born and New York based bassist Martin Wind. 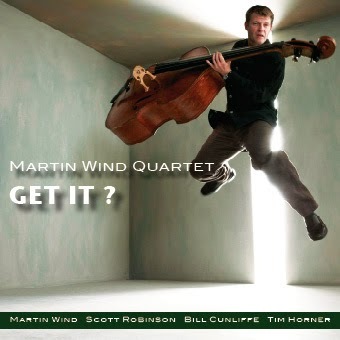 The album features Wind’s quartet which includes the multi-reedist Scott Robinson, the pianist Bill Cunliffe and the former Evans drummer Joe LaBarbera, along with the Italian Orchestra Filarmonica Marchigiana under the direction of Massimo Morganti. The lyrical Wind has a soft spot in his heart for Evan's music, as he relates to Evan's classical training and the sensitivity of the maestro's touch.Wind was also classically trained, can sight read quickly and has superb intonation; all attributes that make him an in-demand sessions player as well as a first call studio musician. The album Turn Out the Stars is an ambitious undertaking and Wind has created a sumptuous treat, a seamless combination of swinging ensemble and lush orchestration work. Three of the songs’ “Turn Out the Stars,” “Twelve Tone Tune Two” and the cinematically sweeping treatment of “Blue and Green” are all Evan’s originals. The Henry Mancini song “Days of Wine and Roses” and the Victor Young composition “My Foolish Heart” were both made famous by Evan’s timeless treatments. 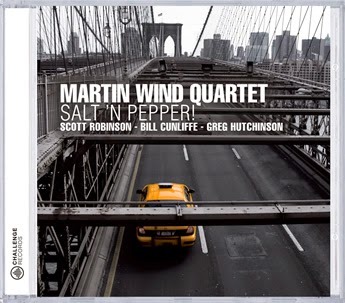 Scott Robinson ‘s” Jeremy” Don Friedman’s “Memory of Scottie,” Phil Woods “Goodbye Mr. Evans” and Joe LaBarbera’s dedication to his former associate“Kind of Bill” round out the music. The players are all in top form and the music glistens with love, respect and a deep sense of connection. I spoke to Wind at some length over the telephone on April 1, 2014 from his home in New Jersey: He is a fascinating and articulate artist. He spoke of his history, his instrument, his influences, other musicians and his making of this fine album. This is Part Two of this Two Part of the wide ranging Interview. For Part I of this interview click here. NOJ: When the great Ellington bassist Jimmie Blanton bowed his famous bass solo on “Body and Soul” it changed the way people thought about how the bass could be used in jazz. You have an exquisite arco technique. How do you see yourself using it to expand the possibilities in jazz? MW: I see it as a possibility to extend my voice as a bassist. People actually do come up to me and say “Wow , I have never heard the bass talk to me before.” I like that. It just happens to be the instrument that I chose. I want to reach people. I want to communicate. I want to tell my story, as much of a cliché as that may sound,. I want to be a melodic player. I want to play in a way that ... draws people in. With the bow I can play sort of like a bebop solo, like Paul Chambers did. Or I can be lyrical-state the ballad, play the melody-like I did on “My Foolish Heart” on this recording or like I did on “Remember October 13th”... with Greg (Hutchinson) and Scott (Robinson). I can tap into a whole different array of sound. I think that is really important for us to engage our listeners so that it is not just that one sound. I (can) get bored and if I am getting bored by my limited use of sounds, than I am sure the listeners are not very engaged. NOJ: A bow can also be very poignant. People who really know how to play arco can expand what they are communicating. MW: Yes. I am amazed that of all the hundreds of jazz bass players that live in and around New York City,. I think you can count on two hands the people that play jazz bass and get a really good sound with the bow. Boris Kosovo, it’s Christian ( McBride), it’s John Pattitucci, George Mraz is fantastic with a bow, Robert Hurst, John Clayton of course, but after a while you run out of names. NOJ: What are three essential songs that feature the bass and that you have found are important milestones in jazz or that you have found of particular meaning to you as a jazz bassist? 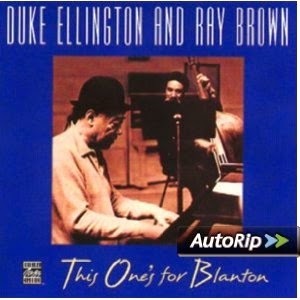 MW: There is the recording with Ray Brown and Duke Ellington, the tribute to Jimmie Blanton ( This One's for Blanton : Ray Brown and Duke Ellington, 1972) that historically is a pretty important one. 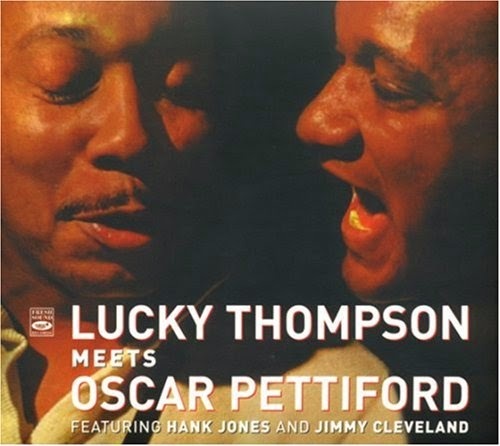 “Trichotism,” the Oscar Pettiford recording with Lucky Thompson ( Lucky Thompson Meets Oscar Pettiford, 1956) is always something that bass players like to shed and learn and play. Everybody needs to know how to play “Donna Lee” ever since Jaco (Pastorious) did that recording even though it’s (on) electric bass. NOJ: You have been involved on several motion picture sound tracks. How did you get started in film scores. MW: I think it was a recommendation, and that is always the way it is. Somebody has to trust you and believe in you and put you in these spots. That person is Bill Mays,somebody who has helped me a lot during my career. He is on my first two trio albums. Obviously he is an incredible pianist and composer and arranger in his own right. I played with him in Europe before I came over here to the United States. When I moved here and was a student, even while I was in the program at NYU, he started to recommend me to singers and to people like Sandy Parks. Sandy is a contractor in the movie business. I got my first part on camera in a movie called “Mona Lisa Smiles.” I was playing in the big band in the wedding scene. While I was there, I had all those hours (waiting around on set) until you have those ten minutes when you are actually on screen in front of the camera. Sandy and I spoke. I told her that I had a symphony background and that I used to play in a symphony orchestra all the time. From there she started inviting me to the recording sessions for movies like ( the Coen Brothers) True Grit and other movies. I always like to sneak into the recording booth after a take and see how the music matches with the image. To be there and listen, a fly on the wall when one of the directors are having discussions with the composer. I mean that is just priceless for somebody who want to be a writer himself. NOJ: How did you break into the active New York Jazz Scene? MW: I don’t know what that really means. It is not like I am appearing at the Village Vanguard and I am on the cover of all the magazine’s all the time. To me it means I feels like I have the respect of my peers. I can make a living teaching and playing. Nobody in our business is going to be wealthy or rich by any means. Just the fact that I can live here comfortably. I can support myself and my family... that means I succeeded. There were several elements that helped. Bill Mays was very instrumental by recommending me to people who have never heard my name before. That is what it takes, somebody to say this guy, why don’t you use him for this rehearsal or that little gig and then that little gig turns into a bigger gig or the next recording. That is how things work. Another element was NYU. When I started there, it was not really a big program, so right away I was the best bass player in the program. They had a really great master class series. They would invite the most amazing jazz musicians to the school that would end up playing with us students. I was twenty-six, twenty-seven years old so I wasn't a beginner anymore. I was in New York two weeks and I found myself playing with Joe Lovano and it was just fantastic! I was like, " Yeah that is what I came here for!" 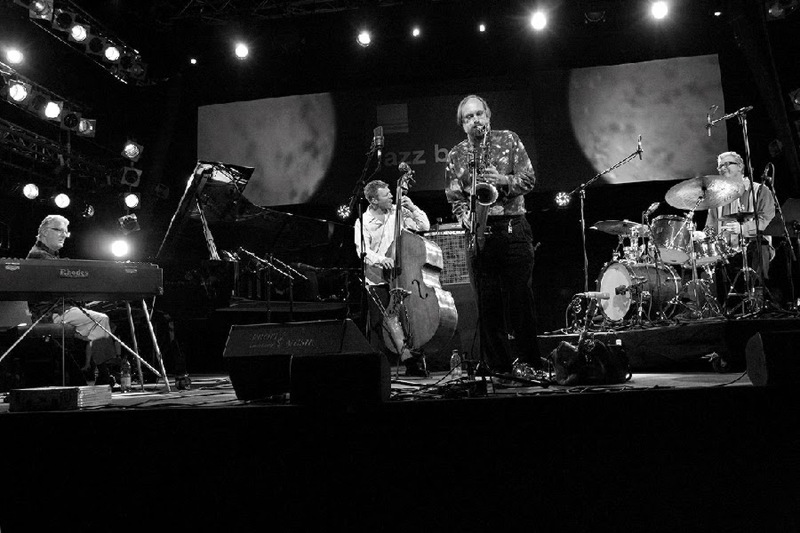 Michael Brecker came, Bob Mintzer came, Joey Baron and Dave Douglas came and the list just goes on and on and on. Not that everybody would hire me on the spot. People have to hear you , they have to meet you, they have to see you again and again, until they finally remember your name. You know it is a long process. 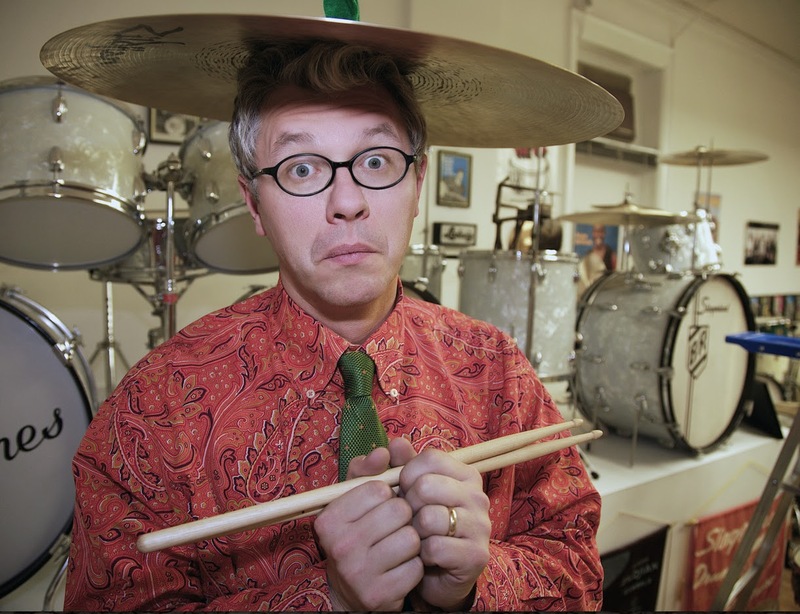 NOJ: In an interview you once said that playing with drummer Matt Wilson was an inspiration, what is it about the irascible Wilson that is so inspiring? MW: Where do I start, the list is so long. There are many things that make him such an influence. The way he embraces everything that happens around him . He embraces it without any judgment and he loves everything that comes his way and turns it into gold. For me that was incredibly important because I started to trust my instincts when I was with him. He would let me know” Martin, what your feeling, what your doing is wonderful so keep doing it.” So it was really a confirmation, he was so instrumental in the search of my voice in that sense. It really is that simple. I mean really you picked these musicians for a reason, hopefully not because they would play for fifty bucks less than better musicians. You picked the musicians for the way they interact, for the way they sound. So then why go up on stage and tell them how to play? You already gave them a vote of confidence by hiring them so then let them get up there and let them go with the material and embrace it. I have been trying to do that more and more whenever I am leading my own groups. NOJ: He (Wilson) does have a very special childlike joy that is very infectious. MW; Yeah, absolutely. I don’t know how many workshops or master classes where I have been with him. It seems like you just can’t tour together anymore just by playing concerts. You go out there and play at colleges, or you play at the performing arts centers and you then you always play a workshop the next day or the day of the performances. You play with the students. I have been with him many times and I have heard what he says to the students. He says, "Don’t go to the instrument with the attitude that you know what it is, what it means to play the drums or any other instrument." He comes to the instrument every day or every time he plays and he says " Wow, that is a drum set, let me see what I can do. Let me see if I can figure out how to play it." That is his childlike sense of discovery that he has been able to maintain, that sense of curiosity. That too has been a really great lesson for me. NOJ: You have been teaching at NYU since 1995? MW: No, I started as a student in 1996. Then while I was a student they asked me to teach non-majors and that was the first thing I did and that was the beginning of 1997. I’m still doing it, in the meantime I have moved onto mainly teaching jazz majors and ensembles. NOJ: And you’re also teaching at Hofstra University? MW: Yes. I have been doing that for two and half to three years. NOJ: So how do you balance being such an active musician, a composer/arranger a band leader, film work and a family man. How do you balance all this? MW: I don’t know you just hope for the best. Sometimes it is a huge challenge. I can tell you that it doesn't always work out. Here is a typical example; I was recently asked by Bill Mays if I wanted to go to China with him for almost five weeks. I did the right thing and I brought it up to the head of the jazz department and he said, well you can go ahead and do that but you’ll have to take the semester off. Well if I did that I would lose my health insurance. So if I lose my health insurance and I have to pay for health insurance for the whole year for myself than I am actually losing money going to China for five weeks. As much as I would love to be there with Bill. That is an example where it just sometimes doesn't work out. I’m still here in both places and it is because I don’t just say, screw it I want to do this tour and I will worry about the consequences lat. I also feel a kind of responsibility to my students, to see that they should get their money’s worth. When my children were younger all of this was so much more difficult. Now they are both teenagers.The last two, three or four years I felt that I could really travel more again, take on more things. because they are both more independent here at home. NOJ: I assume you have a favorite instrument that you like to use. What is it, where was it made? How old is it? And how difficult is it to transport such a large instrument when you travel both internationally and locally? MW: The instrument I am playing is a two hundred year old Tyrolean instrument. The Tyrolean area is the south of Austria and the North of Italy. It is really old and I have been playing it since I was nineteen years old. It was my first real instrument and it happened to be my high school band's instrument. I don’t want to say they gave it to me, but I paid very little, and I had no idea what kind of instrument it was. It has been my sound and been my instrument for so long. I played classical solo concertos,all those orchestras I played with that instrument and I traveled with it all over Europe. Right now, I think the last time I took it on a flight was probably ten years ago. I am not flying with that instrument anymore. I’m just bringing it to any gig that I can reach by car. That’s pretty much the reality of most travelling bass players. 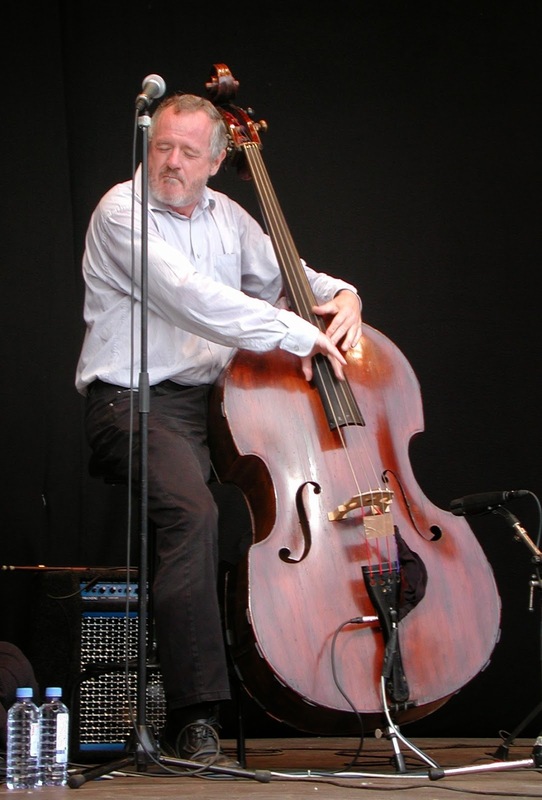 Unless they work with somebody like Diana Krall or so, we just have to play basses that are being provided to us. I am actually in the process of finding a different solution, you can actually take the neck off some basses and a lot of colleagues are doing that now. NOJ: I have seen George Mraz use a Charton bass which has a removable neck. I think there is a link to it on his website. I don’t think it is a full size bass. MW: I’ll check that out for sure. NOJ: How does electric bass fit into your repertoire and do you feel it is a separate instrument that requires its own separate set of techniques? MW: Well there are some techniques that are very unique to the electric bass, like the whole slap/funk technique, that everybody was doing it when I started playing. I don’t know if you ever heard of Mark King? He was playing with a British pop band called Level 42 in the eighties, and he was like the European slap master. I am not really playing it all too often, I just play electric with Janis Sieigel at the Blue Note when she had her cd release. On the album, Christian McBride plays the electric bass on the track. I had a great, great time, I wish I could play more electric bass, but that’s just New York for you. Again you have so many players that everybody has to be so specialized. You know if you need an electric bass player you can get so many great guys. I think if you are a good upright player it shouldn't be a problem for you to play electric bass decently. The other way around that is a whole different story. 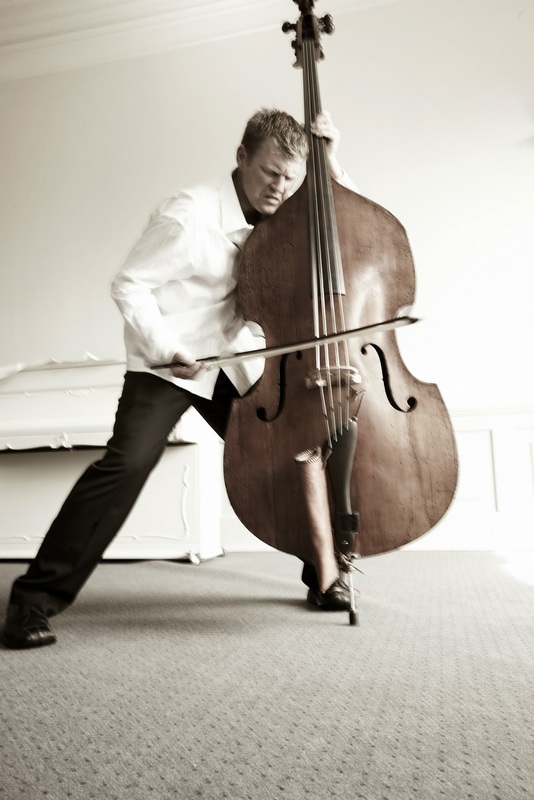 Being an electric player and trying to play upright is certainly challenging. NOJ: Certainly guys like Stanley Clarke and Victor Wooten have taken it to another level. MW: Stanley (Clarke) , John Patitucci , Christian (McBride) these are some examples of people. Really it’s amazing how good they are on both axes. NOJ: Are there any contemporary bass players that you would care to mention that you admire or are they too many to mention? MW: There is always Ray Brown and Ron Carter. To me they just define what we are all trying to do. To me Marc Johnson is just incredibly underrated. I think he is one of the most melodic players out there, unfortunately he doesn't play that much in town anymore. I am sad that I missed Gary Peacock when he was in town because I also grew up listening to him in Keith Jarrett’s trio. He is a very melodic and a very emotional player. I love Charlie Haden and what he has done in Pat Metheny’s trio and on so many other things. Right now I really enjoy listening to Scott Colley, he is a wonderful musician. Larry Grenadier is amazing. Your right there are so many out there. John Clayton is still an influence and he plays so beautifully. Really young guys, I love Christian McBride, Ben Wolfe, Ben Street all wonderful players. Richard Davis, who just won the NEA jazz masters award, the hippest big band player ever cause he never played bass like he was a playing with a big band. My colleague and neighbor Rufus Reid is a good friend and he doesn't stop improving and learning. Now he is becoming this great writer and composer. So the inspiration that you have here in front of your doorstop its just such a unique environment here in New York. 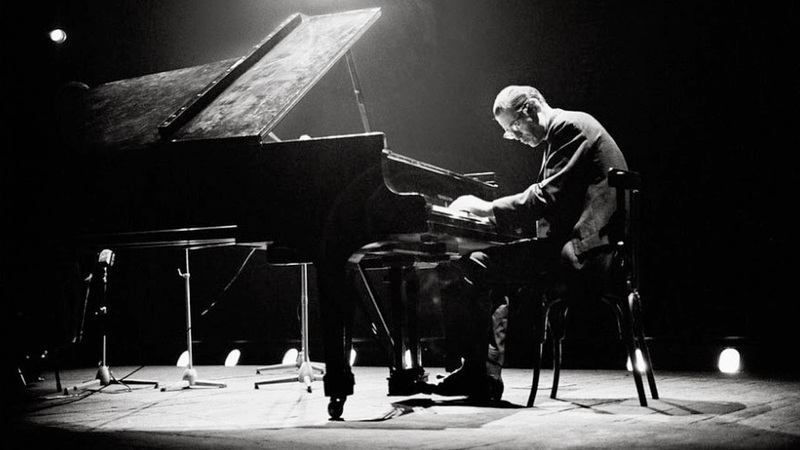 NOJ: Let’s talk about your latest project Turn Out the Stars music written or inspired by Bill Evans. What is it about Evans music that inspired you to work on this project? 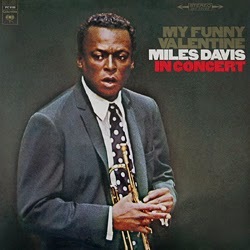 MW: For me the most important, the initial exposure to him was the live from the Village Vanguard album Waltz for Debby from 1961 and that first track “My Foolish Heart” just really struck a chord with me, because how lyrical it was. I found that all my experiences playing European, romantic, classical music was captured in his touch and his approach. I just loved it. I don’t know how you explain it, I felt a connection. I felt wow, we might have the same background. Later on I found out that his family was half Russian and I’m sure he did play Prokofiev and Tchaikovsky and Shostakovich and all that music. That was what really drew me in and then I found out about all the great bass players that he worked with Scott (LaFaro) , Eddie Gomez, Marc Johnson and Chuck Israels and there was just so much to discover. Another thing was his work as a composer. I think “Turn Out The Stars” is just an amazing tune. It is one of the greatest songs ever written. Someone commented on how could I leave out “Time Remembered.” I just saw a review of Turn Out The Stars in Jazz Inside, the reviewer said some listeners might be upset about the tunes that I didn't arrange ( from the Evan's repertoire). I mean how many cd’s am I supposed to do. I can only do one cd at one outing. He (Evans) was such a prolific writer and I cannot do it all on one outing. So (Bill) touched me with his sound anyway and that‘s the most important thing that we relate to. It comes before we analyze what it is we are listening to. Does that sound good? Does that hit a chord? Is that something that I can relate to? Is that something that makes me feel good? His piano touch had that impact on me and I was hooked, it was that simple. "His piano touch had that impact on me and I was hooked, it was that simple." NOJ: And the bass players that he played with LaFaro, Gomez, Johnson these guys were all fantastic bass players. MW: I don’t know if Scott was, but certainly Eddie and Marc studied with classical teachers with the bow and the whole nine yards. NOJ: I was taken by the sort of bossa treatment that you gave to your arrangement of "Blue and Green" on Turn Out the Stars . What is it about songs like "Blue and Green," like "Round Midnight" or even Mingus’s “Goodbye Pork Pie Hat” that seem to ring such a lasting bell in our collective memories and consciousness? MW: I think part of it they have a certain melancholy or sadness to them that give them a certain depth. Some of my favorite composers like Mahler for example, he wrote some of his best works because his daughter passed away. So out of this grief he wrote these heart wrenching songs, compositions that people will still feel two hundred years from now. That is such an amazing thing that through music people can relive what the composer went through. That is really powerful stuff. The compositions that you mentioned, I don’t really know the background of "Blue and Green" but it’s not a happy song for sure. NOJ: Yes your right I guess there is a certain pathos to these songs. MW: Yeah. “Round Midnight” it’s a minor song of course and “Good bye Pork Pie Hat” was written for Lester Young. It was a farewell and I am very receptive to that kind of suffering or mourning put into musical notes. I remember playing once, one of the greatest concerts I ever played in my life was a year after Leonard Bernstein passed away, and it was in dedication to him. We played the second symphony by Mahler which is a killer with the choir at the end. The first ever program was a Berg’s Violin Concerto which was dedicated to Mahler’s daughter, played by Gidon Kremer ( click here) He played it with such intensity that was just scary. He was making faces like he was going through that same sense of loss again and I was scared. I was never exposed to that kind of emotion before on an artistic level. NOJ: What was it like playing with Joe L:aBarbera who was in Bill’s last trio? How did it affect your interpretation of Bill’s music? MW: We met through Bill Mays. I think we had some concerts in Naples, Florida. So that was the first time I met Joe and we really liked playing together, but we really didn't get too many opportunities to do so. We stayed in touch and would see each other at a festival or on the jazz cruise. When I had this opportunity come up to write for this orchestra and I was able to convince them to go with that theme. It was such an easy choice to ask Joe. He is an amazingly complete musician. I never had to tell him to play softer or louder or anything. He knew exactly where his place was in that musical landscape that we tried to create together. He wouldn't really make any suggestions like “Oh Bill would there like to have had it played like this or that way." He respected us enough as musicians to not give us any guidelines. What he did say after we played those concerts ( in Italy) was "Bill would have really loved this. "I thought that was a great compliment and a wonderful thing for him to say. The composition that he contributed is just a beautiful gem. NOJ: How did you Bill Cunliffe and Scott Robinson meet each other and get together for this project? MW: Well the quartet has been in existence for several years. We recorded the album Salt 'N Pepper. For that recording I had Greg Hutchinson, who I had played together with the singer Dena DeRose. Then Tim Horner became the regular drummer of the quartet. He is the drummer on the Get It album, the cut I sent you “Rainy River” is from that album. 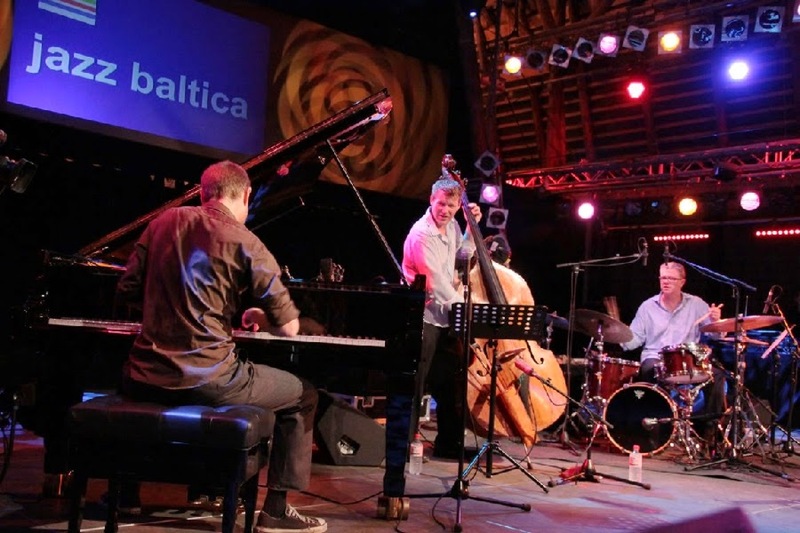 That quartet, Bill Cunliffe, Scott,Tim and myself toured in Europe a couple of times too. I try to get Joe as the drummer whenever we are presenting this particular Evan's project with the quartet. Scott I used to hear every Monday night in Maria’s (Schneider) band, which had their residency at the club Visiones, which was right around the corner from NYU. Then I also heard him play with pianist Frank Kimbrough. He always struck me as so different, so unique and always himself. No matter which style or whose music he would play, he always would sound one hundred per cent like Scott Robinson. I thought that was such an incredible talent to bring to any project. Such an incredible accomplishment. I mean I can try to play traditionally and I can try to play free, but I am not sure if my personality will always come through when I am playing in those different styles, but Scott does it effortlessly. I just thought I want to play with him more and he became the voice of my music. When I write music I am trying to imagine what he is going to do with it. Just like Duke wrote for his guys like Ben Webster and Paul Gonsalves and those guys. MW: Well yeah, you are right. In a way it is absolutely pointless. When we are playing on tours, to play a one-nighter even a weekend is one thing, but then a really incredible experience was to play with him night after night. He would do one thing one night and it would work amazingly. A lot of other people would go right back to that (the next night) because they know it worked so well. He would never step into that trap. He would surprise you by doing the total opposite and try to make that work. I think that’s ..his secret, but I think it’s been a great lesson to me. Try to do something, stand in front of the blackboard like it’s all new. Bill Cunliffe I met through John and Jeff Clayton when Jeff used to live in New York before he went to the West Coast. He said Bill is a wonderful pianist who is on the West Coast and has tried to move to New York. So we started playing. He has that same love for classical music, he is a wonderful classical musician. He has that beautiful touch . He knows so much music, between Ellington and Monk and all the Great American Songbook writers, but yet he wants nothing more than to take a left turn, play free and then swing again. We all share that sense in that we like to do all of those things. NOJ: The release of your new album will also be the launch of your new record label “What If Music”. Why did you start your own label and do you hope to expand it to include other artists? MW: You know about expanding it to other musicians, maybe we should talk again in six months or so when I can assess how much money I lost on this one (Laughing). But seriously,the trend has been going that way. 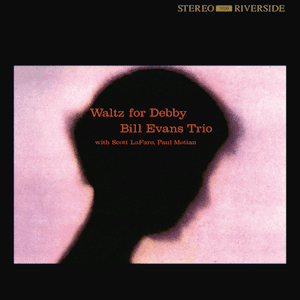 You know Dave Douglas didn't really need to start his own label and Dave Holland didn't need to start his own label. They would always be able to find a label to release their projects. In my case it was just that, nobody really want to go for it. Maybe because they thought, you are never going to bring this back to the States with an orchestra. They might be right. I hope they will all be wrong, because I have some leads and hopefully there will be some performances here with orchestras in the United States. The bottom line for me is that I really believe in the project and I wanted to document it. It is not like it’s so great the world has to hear this. Only I know how much work I put into this, into writing the material, organizing the tour and all of of the other things that go with such a production. Now I feel like, alright, I have documented it and there will be some people who will like it and now I can move on. If I have a chance, I might write more for orchestra, but I wanted it to be out there. So far the reactions have been very, very positive because it is different than so many other things that are being released. NOJ: You are having your release at the Kitano on May 30th? MW: The official release is May 20th, that is when it is supposed to hit the stores, all those thousands of stores out there. The release weekend is May 30th and the 31st of May that weekend at the Kitano Actually we be in CT in Ridgefield on June 1st at Sarah's Wine Bar at Bernard’s Restaurant. I’m sure it will be fun. NOJ: Will the entire quartet be performing this music at the live gigs? MW: Bill Cunliffe will be touring in New Zealand so I asked Bill Mays to play with Scott and myself and I will be flying Joe LaBarbera out for the east coast performances. NOJ: Will you be performing this program with an orchestra at some point in the States? MW: Well it’s not really official yet, but I have a couple of dates in the beginning of November at a fantastic high school outside of Chicago called New Trier . They have a high school musical program that is really on a college type level with incredible support by parents. 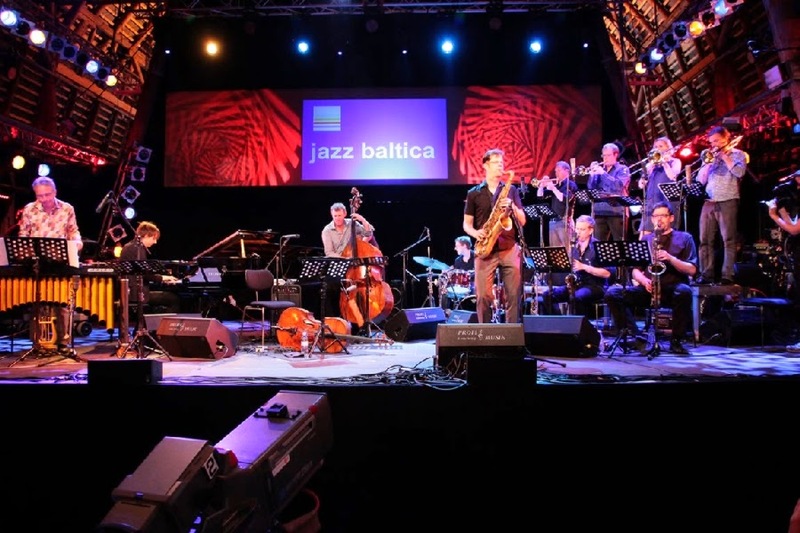 Really amazing, they invite a professional big band there every year, I was there with the Banger Jazz orchestra once. It’s really a fantastic program so they want to present this project there in November and very much hope that this will be happening. I’ll let you know when it is confirmed. NOJ: So what other projects do you have in the works, this is your main project right now? MW: This is the main focus right now, but I’am very much engaged in the duo that I am doing with Philip (Catherine). We are going to be doing a second recording soon and I want to write some new music for that. Something else that might be of interest to you, I just became part of a new group Matt Wilson and Anat Cohen and myself called NY3. We just recorded and will be at the Village Vanguard in June for a whole week. There is some other things like I have been working with Dena DeRose and Matt Wilson . She is working on a new album that is a tribute to Shirley Horn and we will be playing some concerts in support of that album. The pianist Ted Rosenthal just released a new album of Gershwin material that I played on and will probably support with some live gigs with him at Dizzy’s and the Kitano. A lot of doing my own project, but playing with all these musicians as a sideman is very, very fulfilling too. NOJ: Well thank you for being so generous with your time and good luck with your new album..